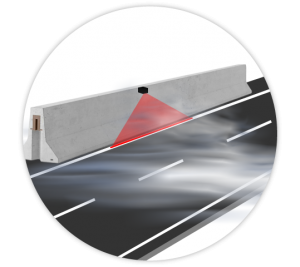 Everywhere is necessary to increase the safety of driving in adverse weather conditions on all kinds of roads (urban, interurban, highways), even using existing infrastructure (street lamps, guard-rail, new-jersey barriers, etc.). Or signalling/illuminating roads/obstacles on the road, slopes, harbors (even with clear skies), with very low energy consumption. 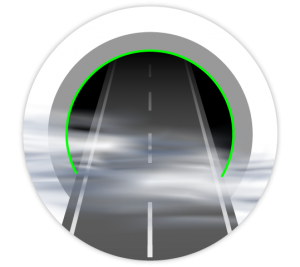 In case of dense fog it helps prevent rollover accidents on the highway, and generates reference visible and safe to follow. Roundabouts are high-end traffic accidents (Istat data), with often tragic consequences, especially in adverse weather conditions. In this conditions they become hard-to-find, if not before reaching them at high speed. The perimeter band, illuminated by the laser beams, is clearly visible from a distance, even under clear sky conditions and in the absence of fog. With a single Laser (and therefore with the power consumption equivalent to a single LED) we can illuminate the arch of a tunnel entrance. 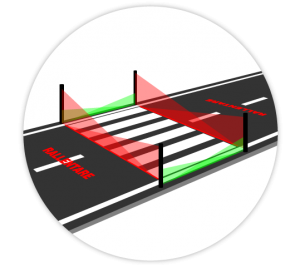 An original and innovative solution, to make even safer pedestrian crossings, especially in case of poor atmospheric visibility, with a multi-color Laser system, and with projections on the ground of go/stop signal for cars and pedestrians. 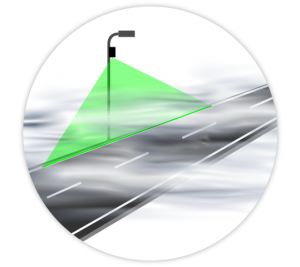 With LaserAid mobile devices is possible to define and make visible (even in fog) roadworks or hazardous areas for the circulation. 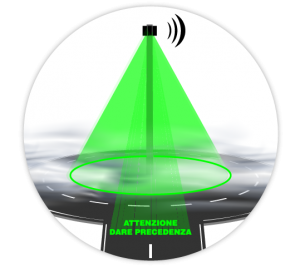 In case of accident in the fog they are very useful, for Police, to project in the direction of traffic, safety information to prevent further disasters or for directing traffic without departing from the vehicle. Especially in the night and in the fog is often difficult for small tourists boats, find the way back. LaserAid Marinas Devices produce bright, clearly visible references from far away visible that facilitate the return of boats.